A typical cooling system consists of two or more sets of rotating screens. When the differential across a set of screens reaches 15 cm (7 inches), an alarm is activated. If the differential reaches 25 cm (10 inches), the screens start to rotate and back wash pumps are started initiating a backwash procedure to clean the screens of any accumulated debris. Differential is measured by monitoring the back pressure created by displacing water in sensing lines using regulated air flow. Lines are located upstream and downstream of each screen. Upstream and downstream pressures are monitored by a recorder set up to read differential flow. Transmitter outputs are fed into the recorder so operators have tide reference, individual screen differentials with alarms and auto start for wash pumps. These contacts are fed into the screen logic by the recorder alarm option. DPharp was recently selected for this application by a major Texas electric utility company when they redesigned their screen differential monitoring and control system. The company selected DPharp over their plant standard because of its ability to withstand plant air applied to sensing lines during blowback operation--without having to be taken out of service, and with no shift in calibration after completion of blowback. Transmitters have been in operation since November of 1996, and plant maintenance personnel are very pleased with their performance. A simplified screen differential monitoring diagram is shown below. 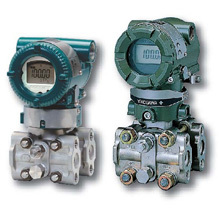 Solenoid valves or a timer are used to initiate automatic blowback operation once a day. DPharp monitors the differential across the rotating screens.